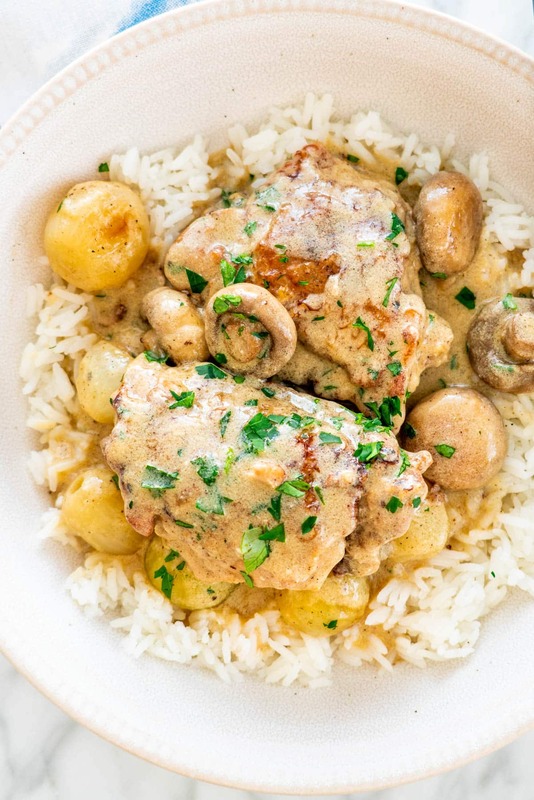 This Chicken Fricassee recipe is an easy and hearty weeknight meal. This comforting stew is loaded with pearl onions, mushrooms, and chicken. I guarantee you’ll be craving seconds! I’ve had this classic French book for so many years now and I’ve always been afraid to try any of the recipes in there. I’ve always thought of French food as difficult or time consuming, but very delicious. Well this past weekend I decided to look through the book and see if there was any dish in there that wouldn’t scare me off. 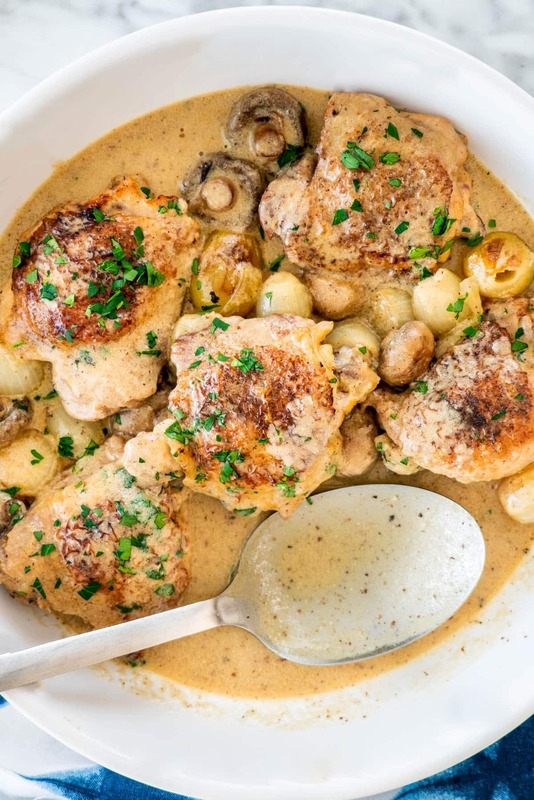 Voila, I found this super easy chicken fricassee! What I really liked about this recipe is that I happened to have most of the ingredients already! They’re mostly basic kitchen staples. It’s not something you can whip up in 30 minutes, but it’s so worth it. However, I really enjoyed the flavors of this dish! You know me; I love mushrooms, so chicken and mushrooms together, how can you go wrong? While this French recipe might sound complicated with a hard-to-pronounce name like fricassee, this recipe is actually very simple and rustic. This is a stew made from chicken simmered in a creamy white wine sauce, and the rest is up to the cook’s discretion. This stew is known for versatility; you can add any veggies you like! This stew is rich, creamy, filling, and made with basic ingredients. Keep scrolling for the full recipe and ingredient amounts. 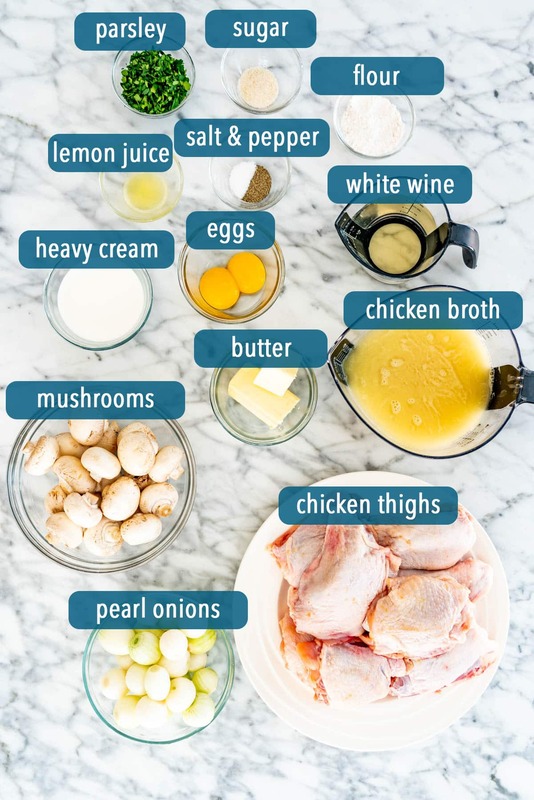 Chicken thighs – I like to buy bone-in chicken thighs with skin because this is a slow simmered stew. You’ll get tons of awesome flavor from that chicken. You can use boneless & skinless thighs or breasts if you prefer. Butter – Always use unsalted butter so that you have full control over the sodium level in your stew. Salt & pepper – Season both the chicken and stew to your own preference. Pearl onions – These soften and get a beautiful mild flavor with a hint of sweetness. You can use chopped regular onion instead. Button mushrooms – I used these because they’re perfectly bite-sized. Cremini mushrooms would also work and if they’re big, just chop them up. Flour – This is used to thicken the stew. You can use a cornstarch slurry instead. White wine – I used a Chardonnay for this recipe. Other dry varieties that you can use are Pinot Grigio, Pinot Blanc, and Sauvignon Blanc. Chicken broth – this is what will make up the majority of your liquid for stewing. Use a low-sodium broth. Lemon juice – With the richness from butter and cream, a bright pop of lemon helps bring out the flavors in the stew beautifully. Sugar – As everything stews, the sugar will caramelize. Egg yolks – These will thicken your stew at the very end. Heavy cream – I used 35% MF cream for this recipe. You can use heavier or lighter cream depending on what you like best. Fresh parsley – We eat with our eyes first, right? I love to add a super easy pop of color as garnish. What Else Can I Put in Fricassee? Sear the chicken: Heat the butter in a large skillet or braiser over medium high/ high heat. Add the chicken, skin side down, and let it sear until it releases from the pan. Flip and sear the other side. Don’t worry about cooking it all the way through – it has lots of time to stew. Remove the chicken from the pan. Cook the veggies: Reduce the heat and add the mushrooms and onions to the skillet. Saute for about 5 minutes, then add the flour. Cook for another minute and stir well. After that, add the wine and let it cook down for a few minutes, then pour in the broth, lemon juice, and sugar. Cook the stew: Add the chicken pieces back to the skillet in a single layer. Cover and simmer for 25-30 minutes. Finish the fricassee: When the stew is done cooking, adjust for seasoning. To make the sauce thicker, whisk the egg yolks with the cream and temper them by very slowly adding a 1/2 cup of the sauce. Whisk well to avoid scrambling. Stir the egg mixture and remaining butter into the fricassee. Garnish with parsley and serve! To make this recipe gluten-free, you can leave the flour out. Add a cornstarch slurry (equal parts water and cornstarch) at the end, after the eggs have been mixed in, until you’ve reached your ideal consistency. The sauce must be simmering when you whisk in the slurry for it to thicken. 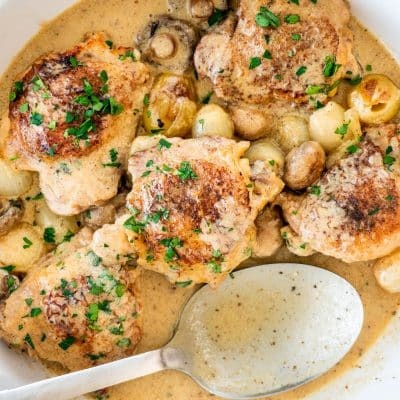 What Can I Serve With Chicken Fricassee? Since this recipe is loaded with protein, veggies, and will keep you nice and full, this is perfect all on its own. You can serve it over rice, mashed potatoes, polenta, riced/mashed cauliflower, or use a nice crusty bread to soak up that sauce. 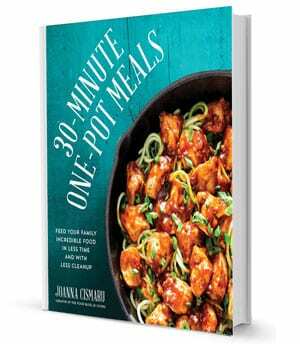 This recipe will keep fresh for 3 days if stored in an airtight container in the fridge. You can reheat it either in the microwave, or in a skillet over medium heat. I wouldn’t recommend keeping this in the freezer. Because of the fat content in the cream, yolks, and butter, your sauce will likely break and separate once it’s thawed. Did you love this classic French recipe? Try these! 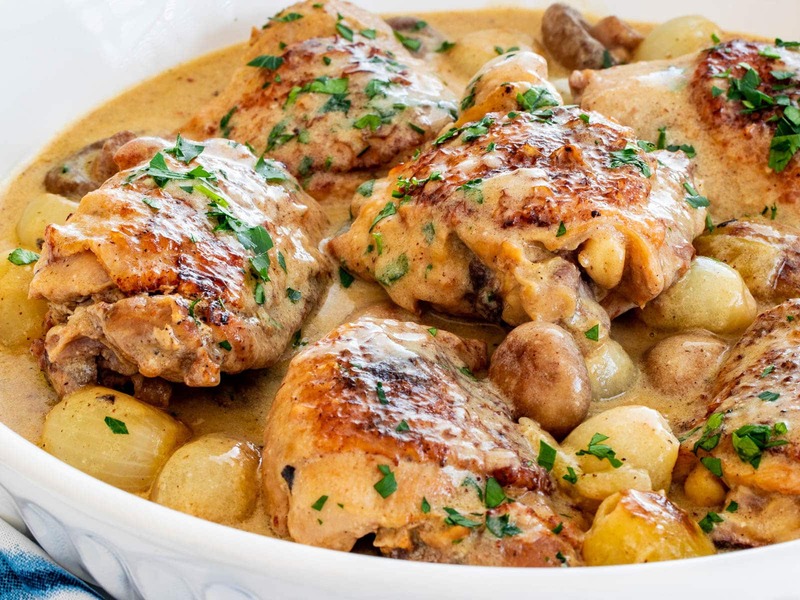 This Chicken Fricassee recipe is an easy and hearty weeknight meal. 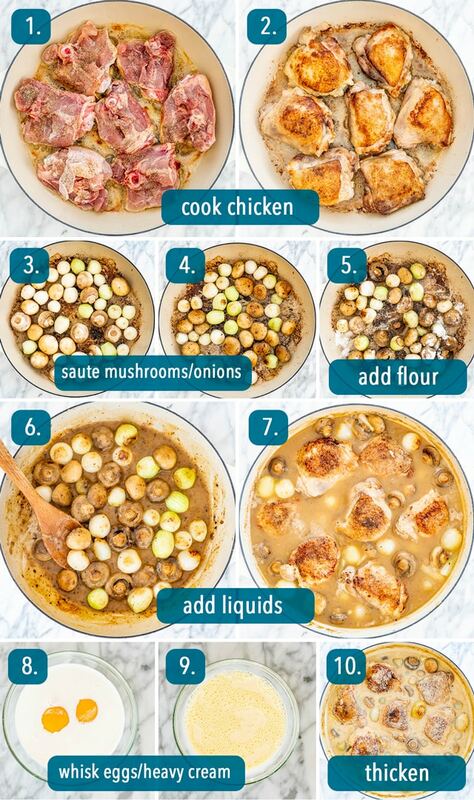 This comforting stew is loaded with pearl onions, mushrooms, and chicken. I guarantee you'll be craving seconds! Prepare the chicken: Pat dry the chicken thighs with paper towels. Season with salt and pepper. Sear the chicken: Heat the butter in a large skillet or braiser over medium high/ high heat. Add the chicken, skin side down, and let it sear until it releases from the pan. Flip and sear the other side. Don't worry about cooking it all the way through - it has lots of time to stew. Remove the chicken from the pan. You might have to do this in batches, so repeat with remaining chicken. Transfer chicken to a plate. Cook the veggies: Reduce the heat and add the mushrooms and onions to the skillet. Saute for about 5 minutes, then add the flour. Cook for another minute and stir well. After that, add the wine and let it cook down for a few minutes, then pour in the broth, lemon juice, sugar and stir. Cook the stew: Add the chicken pieces back to the skillet in a single layer. Pour in the juices that have accumulated on the plate too.Cover and simmer for 25-30 minutes until the chicken is cooked through. Taste and adjust seasoning as needed. Finish the fricassee: When the stew is done cooking, adjust for seasoning. To make the sauce thicker, whisk the egg yolks with the cream and temper them by very slowly adding a 1/2 cup of the sauce. Whisk well to avoid scrambling. Stir the egg mixture and remaining 2 tbsp of butter into the fricassee. Garnish with parsley and serve! Serve this over rice, mashed potatoes, polenta, riced/mashed cauliflower, or use a nice crusty bread to soak up that sauce. Jo, thanks so much for this recipe!!! I LOVE this stuff and thought I could never master it! Thank you, thank you for a can do recipe. Gotta go get chicken thighs and cream now! 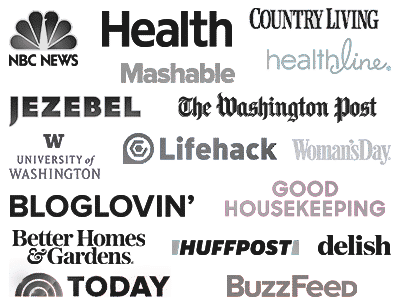 BTW, I love your blog and have tried, loved and pinned so many recipes. You are my go to girl! You’re going to love this one! Let us know how it goes 🙂 We’re so glad you’re loving the recipes! Look yummy, may I know what oil to use and how may tablespoons? Sorry there’s no oil in this recipe, I just fixed the instructions. Thanks for catching this! Looks great! I love trying new recipes, but aren’t the onions overpowering? Depends if you like onions or not, you could always reduce the onions, though they become sweet and quite nice.